Three new subsidiaries of Anton Paar have recently officially started operations. Anton Paar New Zealand celebrated the opening with CEO Friedrich Santner. He explained the history of Anton Paar in New Zealand and talked about the manifold applications of our instruments. The opening ceremony was attended by the team that helped set up the office in Auckland, as well as legal advisors, bank representatives, and internet administrators. In addition to all 24 employees of Anton Paar Australia and Anton Paar New Zealand including the manager Jutta Rieger, the office neighbors of Roche Diagnostics and Sharp were also present at the opening ceremony of Anton Paar Australia in the Sydney office. Those who helped in the start-up phase were invited to participate. The highlight of the opening celebration was a delicious cake from Austria called "Sachertorte". Our subsidiary Anton Paar Thailand has also been officially active for a few weeks. From the office on the 39th floor high above Bangkok, twelve employees and the general manager Duangrat Woonwiriyakit care about the sales area Thailand, Myanmar, Laos, and Cambodia. 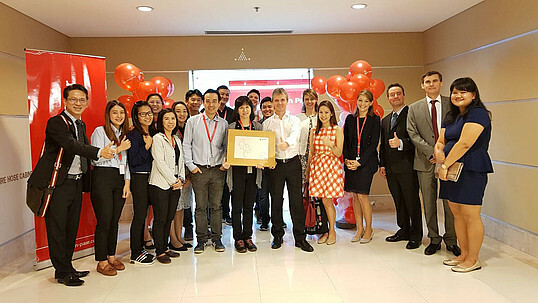 In addition, the APAC Tech Center in Kuala Lumpur has officially started into operation. The opening was celebrated with the sales partners of the region. The APAC Technical Center is equipped with the latest measruring instruments of Anton Paar and used for training courses for sales partners and employees of regional subsidiaries as well as for end customer seminars.